A 21-member delegation represented USA and the American Radio Relay League (ARRL) at the Twelfth World Championships of Amateur Radio Direction Finding. The 2004 championships attracted 327 competitors from 28 countries to Brno, a town about 110 miles southeast of Prague. The competition areas were very large (about 4800 acres) and forested, with occasional thickets, slopes, and cliffs. One seasoned competitor described the Saturday course as the toughest he has ever done. A shallow river ran through the middle of that site. It was in a deep ravine that had to be scaled to cross it, even on the trails. The Thursday finish corridor crossed a stream, resulting in relatively lengthy times from the electronic punch at the start of this corridor to the finish line. 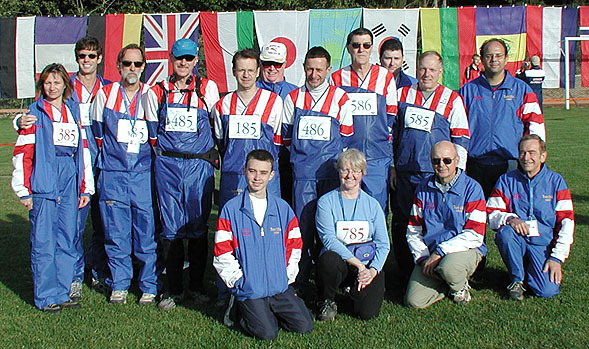 The World Championships of ARDF take place in even-numbered years. This was USA's fourth trip to the World Championships. Some Team USA and Team Australia members participated in a special ARDF training camp in Hungary just before the Championships, organized by Gyuri Nagy KF6YKN. All competitors were placed into five age categories for males and four age categories for females, in accordance with ARDF rules of the International Amateur Radio Union (IARU). Each country was permitted to have up to three persons per category on its team. Medals were awarded to best individuals and best teams in each age/gender division and on each band. The 2004 Team Captain was Harley Leach KI7XF, shown at right as he approached the two meter finish line. Richard Thompson WA6NOL of Santa Ana, CA and Dennis Schwendtner WB6OBB were Team USA Trainers. Dale Hunt WB6BYU of Portland, OR and Marvin Johnston KE6HTS of Santa Barbara, CA represented USA and IARU Region 2 on the International Jury overseeing the competitions. Each was assigned to be a Course Marshall at one of the radio foxes. Three non-competing visitors also accompanied the team. Each competitor competed once on each band. 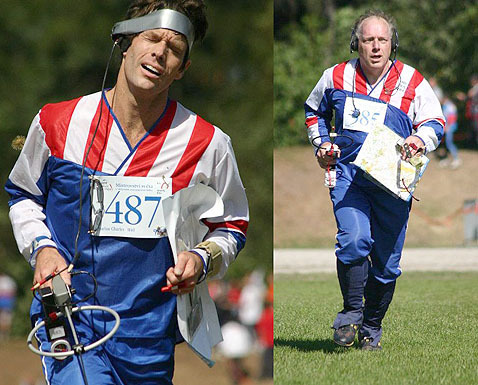 In ARDF championships, competitors are individually timed. One in each age/gender category starts every five minutes, so the starting process took almost three hours on each competition day. By the luck of the draw, on Thursday Jay Thompson W6JAY was first starter in M19 category (no wait) and Gyuri Nagy KF6YKN was last starter in M40 category (2 hours and 50 minutes wait). Other team members waited from 10 minutes to 2:25 for their starts. 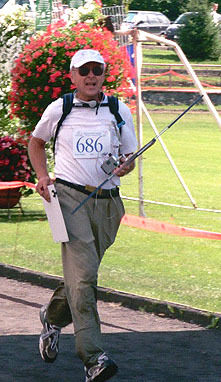 The 2004 course time limit was 2-1/2 hours. 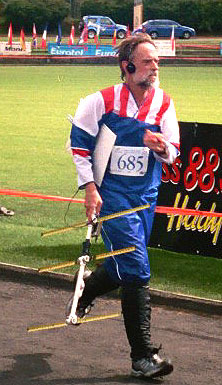 Karel Fucik of Czech, the gold medal winner in the five-fox prime age category for men, completed the 80-meter course in less than 53 minutes. Two Team USA members had top-ten individual finishes in their categories. Nadia Scharlau (photo at left) placed 6th out of 22 on Thursday. Her Saturday time was much better, only 10:10 above the first place finisher in her category. Unfortunately, on that day the battery fell out of her 80m receiver on the way to her final transmitter. She had to find the last fox and get to the finish using her previous bearings. That time loss put her in 11th place instead of perhaps earning a trip to the medal podium. Bob Cooley KF6VSE (photo at right below) placed 9th out of 34 in M60 category on two meters. Gyuri Nagy KF6YKN was in 16th place out of 46 in M40 on Thursday and improved to 12th place in M40 category on Saturday with a time that was 25 minutes better. European and former Soviet countries have been holding ARDF events for over 30 years, so it's no surprise that they dominated the standings. In the first of the two days of competition, six nations garnered all of the medals, and three of them won 90 per cent of the medals. Three more countries were added to the medal count stats on Saturday, but the overall totals were still dominated by Czech, Russia, and Ukraine with 34, 28 and 26 medals, respectively. Many thanks to the ARRL Foundation and the Colvin Award Fund for providing a portion of the entry fees and in-country food/lodging/transportation expenses of the USA team. The remainder of these fees, along with training expenses and domestic/international airfares, were paid by the individual team members. Team members greatly appreciate the efforts of stateside supporters who have organized practice sessions for them and others. If you would like to help train our team for future events, contact the undersigned.